Last week, all of a sudden, the numpad of my laptop stopped working. Well, it didn't really stop; numbers weren't working at all, that's right, but the "+" sign was highlighting text, and I could still use the small "Enter" and "Page up/down" keys without problems. Apparently it happened without a reason, but I was definitely sure it was going to be quite easy to fix the problem. Until I realized that none of the solutions I found on the Net (Like this one and this one) was working for me. A lot of forum threads suggested to check whether the problem gets solved by pressing key combinations like <CTRL><SHIFT><NUMLOCK> or <CTRL><ALT><NUMLOCK>, or something like that. None of these solutions worked for me; however in this article (which is one of those that mainly suggest the key combination) there's something written that has something to do with the solution: it's about the "Mouse keys". 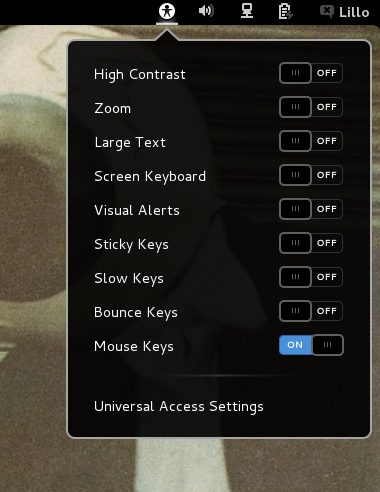 After a long day feeling dumb as hell, I finally noticed that one of the switches in the Gnome3 Universal Access area was set to "on" (while I normally have all of them set otherwise). Damn, it was the Mouse Keys stuff. Meaning: I actually allowed the pointer to mess around. Well, I have no idea why that switch was set to "on".. I probably pressed a weird combo of keys and it got activated. But I'm glad that this time it was all just about a stupid flag. I recently solved a problem with a kworker process taking up more than 60% of one of my eight CPUs. What is kworker? Here is a simple yet good explanation. I forgot to take snapshots, but the scenario was more or less as shown in figure (source). Before starting, please note that this is not a OS-specific issue. Read this stuff again if you're not fully convinced about it; the above links could suggest this is only a Ubuntu issue, but it's not (I'm using Fedora for example). I don't really like to say I "solved" the problem as I see the following as a workaround, but it actually works good. I just followed what I could find here and here. So, here is what you should do if you see that something is taking up too much CPU. Make sure the offender is indeed a kworker process. Use top, or ps aux | grep kworker if you prefer. You should see a gpe with a very high value. In my case the value of gpe1B was 162, which is ok; gpe06 had instead a value of (approximately) 170.000. 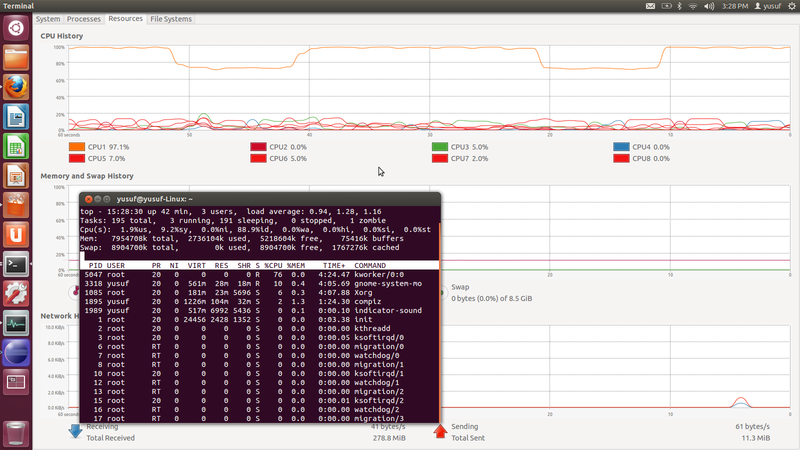 This is definitely NOT ok: that's the proof the problem is with ACPI interrupts. Note that some commands will be executed even without administrator rights, but the trick will not work (or at least not completely). So it's good to keep the admin rights until the end. Save, close, and we're done. Sweet.